As an avid sports fan I am fascinated by the current hatred being spewed out in the direction of LeBron James. We are in rare territory here. I'm not sure we've ever seen the best player in a sport also be the most disliked player in that sport. LeBron may be the first...and I don't really understand why. Now I must first begin with a confession...I actually like LeBron James. I have for a while. 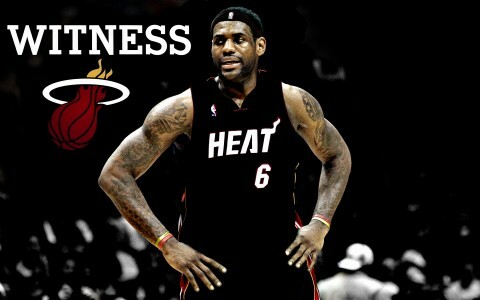 I don't have a team I cheer for, I enjoy LeBron's style of play, and I slowly found myself cheering for him. I didn't intend for it to happen, but it happened anyway. I cheered for him when he was a Cavalier and I'm cheering for him now as a Heat player. Sorry...I know that's not popular to hear, but there it is. As I "witness" the barrage of criticism aimed at LeBron, I feel I need to make a few comments. Firstly, I'm with the rest of America in HATING the way he made "The Decision." 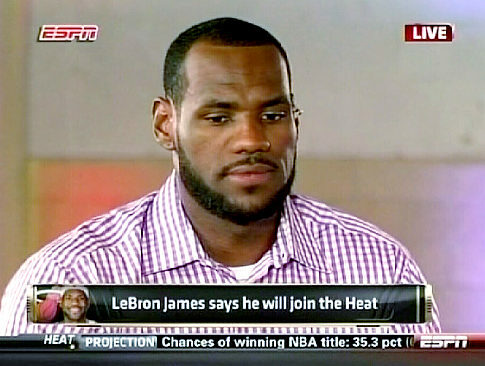 That was just a terrible way of announcing his decision to sign with Miami...just terrible. That said, however, I don't think his actual decision was wrong. He had given Cleveland seven good years of his career and they had 'thanked' him by giving him NO legitimate teammates. I would leave too if in seven years the best they could do was a Shaq well past his prime and Antawn Jamison. Really? That's it? In seven years? No wonder he bolted. No one in the league could have done better than LeBron with the supporting cast they gave him. The fact that he led that team to the league lead in wins two straight years, in addition to a trip to the Finals, is a miracle in itself. Along those lines, I don't really have a problem with how Dwayne Wade, Chris Bosh, and LeBron James orchestrated their current roster. Every championship team has more than one superstar player. You have to. Kobe didn't win until he got Shaq, then had years of bad teams again until he got Pau Gasol. Boston was terrible until they somehow got three future hall-of-famers to join forces. David Robinson couldn't win until Duncan came along. I could go on and on. And while its usually the General Manager of the team that is putting together the roster, I don't really see a problem with the players making it happen, especially if their respective GMs aren't getting the job done (as with LeBron). And finally, a few thoughts regarding this current NBA Finals and LeBron's inability to close games. Firstly, we are such creatures of the moment, constantly asking the question "What have you done for me lately?" If you can remember back to a couple weeks ago, LeBron DOMINATED the Celtics and the Bulls, carrying his team into the Finals with relatively little help from Wade and Bosh. He was phenomenal in most of the fourth quarters of those series, but yet we continue to think of him as someone who cannot close out games. Secondly, I will freely and openly admit that LeBron has not played as well in the fourth quarter during the Finals. That's obvious. But the way the commentators are talking, you would think he's the worst player in the league. I watched every minute of the fourth quarter last night and I think LeBron is getting unfair criticism. He is getting killed in the media for only having 2 points in the fourth quarter last night, but I actually thought he played really well. He was really aggressive with the ball throughout the period, but just didn't score much because he was constantly finding his teammates for wide open shots. He finished the game with 10 assists, but I think 5 or 6 of them were in the fourth quarter alone. He also scored a huge basket and got fouled, only to have it taken away on a terrible offensive foul call. The defender (Tyson Chandler, I believe) was clearly within the circle where you cannot take a charge, and his feet were not set anyway. LeBron also had a huge block that saved a layup, and he altered a number of other shots that weren't blocked, but were definitely missed because of LeBron's defensive presence. LeBron and the Heat by no means lost that game last night, the Mavericks just won it. They played great, hit clutch shots with Heat defenders right in their face, and deserved the victory. I don't think that means that LeBron can't close out the fourth quarter. I would hope these basketball 'experts' that we see on TV would have more sense than to judge someone's performance based solely on points scored. That simply isn't a true and accurate representation of quality of play. Should LeBron have scored more? Yes. Should he have made some of the shots he missed? Of course. Did he play up to his potential? By no means. But is he some terrible player who shrinks under the spotlight and can't finish a game strong? Definitely not. He finished the game with a triple-double for goodness sake. But what can you do...haters gonna hate!